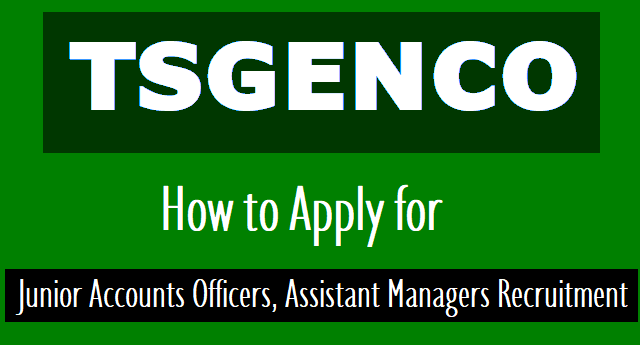 How to Apply for TSGENCO JAO Junior Accounts Officers, Assistant Managers (HR) Recruitment 2018, How to fill the Online Application form for TSGENCO JAO Junior Accounts Officers, Assistant Managers Recruitment 2018, Online application form filling instructions for TSGENCO JAO Junior Accounts Officers, Assistant Managers Recruitment. How to Apply: Telangana State Power Generation Corporation Limited (TSGENCO), Hyderabad has issued the Junior Accounts Officers Recruitment 2018 notification. Applications are invited through On-line from the eligible candidates in the proforma. Application which is made available on TSGENCO WEBSITE www.tsgenco.co.in and http://tsgenco.cgg.gov.in to the post of “Junior Accounts Officer” and Assistant Manager (HR). Unreserved Category - Rs 150 as application processing fee and Rs. 350 as Examination Fee. SC/ ST/Backward Class Communities and Physical Handicapped - Rs 150 as application processing fee only. Assistant Manager (HR) - The applicant must possess M.B.A (HR) or MSW or 2 years Diploma in personnel Management /Human Resources /Industrial Relations. Junior Accounts Officer - The applicant must possess First Class Post Graduate Degree of M.Com from any University in India established or incorporated by or under a Central Act, Provisional Act, or a State Act. The candidates will be selected on the basis of a Written Test.